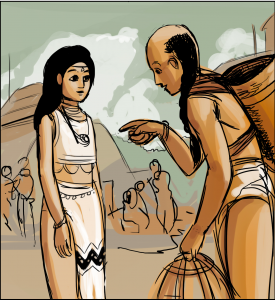 Artist’s depiction of a long-range trader named Perico wearing his trader’s backpack and signifying hair style. (C) 2018 by G.C. 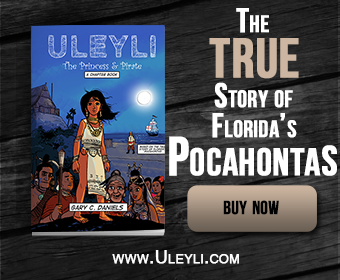 Daniels from the book Uleyli: The Princess & Pirate- The True Story of Florida’s Pocahontas. Editor’s Note: This Spanish eyewitness account from Garcilaso de la Vega’s Florida of the Inca reveals two different types of Native American traders that existed in Florida in 1539. The first was a more localized merchant who traded for everyday goods. The second was a more long-distance merchant who traded in high-value goods including precious metals, gemstones and pearls. The Spanish named the short-distance trader, Marcos, and the long-distance trader Pedro, although his real name was recorded as Perico by other chroniclers. Throughout the time that Governor Hernando de Soto was wintering in the camp and pueblo of Apalache, he always took care to inquire and learn what lands and provinces were beyond toward the west in the region that he had thought and planned to enter in the following summer, in order to see and discover that kingdom. With this desire he was always gathering information from the Indians who had been serving for some time as domestics in his army, and from those newly captured, importuning them to tell what they knew about that land or any part of it. Since the general and all his captains and soldiers were careful and diligent in doing this, it happened that, among the other Indians whom they took, those who were scouring the country captured a young Indian sixteen or seventeen years of age. Some of the Indians who were servants of the Spaniards and were attached to their masters knew him. They told them, so that they might tell the governor, that that youth had been a servant of some Indian merchants who were accustomed to enter with their merchandise, selling and buying, many leagues into the interior country, and that he had seen and knew what the governor was trying so hard to learn. It is not to be understood that the merchants went to seek gold or silver but to exchange some articles for others, which was the traffic of the Indians, because they did not make use of money. With this information they asked the youth what he knew. He replied that it was true that he knew about some provinces that he had visited with his masters, the merchants, and he would venture to guide the Spaniards twelve or thirteen days’ journey, which was as much as he had seen. The governor turned the Indian over to a Spaniard, charging him to take particular care of him so that he would not escape from them, but the youth relieved them of this anxiety, for in a short time he became so friendly and familiar with the Spaniards that he appeared to have been born and bred among them. The newly captured Indian confirmed what the first had said and very willingly offered to take and guide them through the provinces that he had traversed, which he said were many and large. Asked about the things that he had seen in them, and whether they had gold or silver or precious stones, which was what they most desired to know, and being shown gold jewelry and pieces of silver and fine stones set in rings that were found among some of the captains and principal soldiers, so that he might better understand the things that they were asking him about, he replied that in a province called Cofachiqui, which was the most distant one that he had visited, there was a great deal of metal like the yellow and the white, and that the chief traffic of the merchants, his masters, was to buy those metals and sell them in other provinces. He said that besides the metals they had a very large quantity of pearls, and to tell this he indicated a pearl in a setting he saw among the rings that they showed him. Our Spaniards were very pleased and rejoiced at this news, desiring to see themselves at once in Cofachiqui in order to be masters of so much gold and silver and so many precious pearls…. …our men captured in the province of Apalache two young Indians who had offered to guide the Castilians. One of them, whom the Christians named Marcos, without having baptized him, had now guided them over all the road that he knew. The other, whom they had named Pedro, also without baptizing him, was the one who was to guide them from there on as far as the province of Cofachiqui, where he had said they would find much gold and silver and many valuable pearls. This youth went about with the Spaniards as familiarly as if he had been born among them….